Tanners Car Care is an established brand, stocked by a global ‘top 5’ retailer. 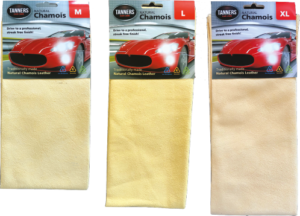 Deri2000 Chamois is stocked in 3 of the top 5 global retailers. Packaging is clearly marked with helpful “Zero Microplastics” branding. Our trusted quality, with British Standard approved natural chamois leather. Buyer assured peace of mind with Deri2000 audit backed ethical and environmental good practices. Many available size and shape options to suit your specific market needs. Deri2000’s proven track record of direct to retail supply. Our Tanners Natural Chamois exceeds the industry standard BS6715:1991. You’ll find it has a consistent finish and is super soft and absorbent (up to 6x its weight). So you can be assured of the finest quality, traditionally made Natural Chamois Leather. Tanners Natural Chamois is a Zero Microplastic product, in contrast to microfibre cloths which are oil based and shed microplastics with each use. 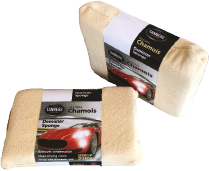 Natural chamois is a genuine, natural, high performance drying option.